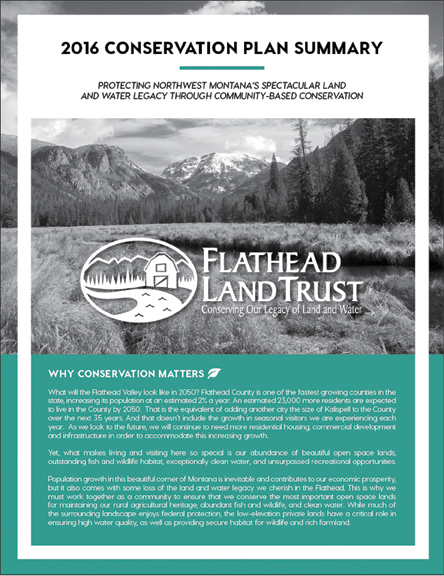 May 13, 2016 – Flathead Land Trust released a new plan today intended to guide our future private land conservation work in northwest Montana. It identifies four focus areas and the most important properties within those areas to conserve. To Download a Copy of the Conservation Plan Summary Click Here. To Download a Copy of the Full Conservation Plan (with Maps) Click Here. The new conservation plan begins by posing a question, what will the Flathead Valley look like in 2050? The plan then highlights that Flathead County is one of the fastest growing counties in the state, increasing its population at an estimated 2% a year. It states that an estimated 23,000 more residents are expected to live in the County by 2050, which is the equivalent of adding another city the size of Kalispell to the County over the next 35 years. This doesn’t include the growth in seasonal visitors experienced each year. “As population growth results in more residential housing, commercial development and infrastructure and contributes to the region’s economic prosperity, it also comes with some loss of the open space lands, fish and wildlife habitat, and clean water we all cherish. Our conservation plan is intended to prioritize which private lands to try and conserve before it is lost to development,” said Ryan Hunter, the Flathead Land Trust employee responsible for developing the plan. The new plan replaces a conservation plan that was developed in 2006 and which focused efforts on the Flathead River to Lake Initiative, a collaborative effort to protect the most critical open space lands along the Flathead River and north shore of Flathead Lake. The Initiative has been successful in permanently protecting almost 5,000 acres since 2002, adding to a conservation network totaling almost 11,000 acres of private and public lands. While the Flathead River to Lake Initiative will continue to be a major focus, three additional focus areas are identified in the new plan. These include the conservation of important farmland in Flathead Valley, the conservation of important migratory bird habitat in the valley, and community projects, which include efforts that involve enhancing public access to or use of open space land, provide outdoor recreation opportunities, or are strongly associated with a particular location-based community such as the North Fork area. Questions? Contact us at 752-8293 or ptravis@flatheadlandtrust.org.